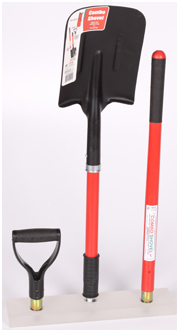 Military folding shovels are compact and well-suited for garden-variety camping duty. Full-sized landscaping shovels are more functional but are a pain to pack. Extreme Outback Products offers the best of both worlds for people who do serious digging but need stowable convenience: The Ultimate Shovel. Engineered in Australia and tested in the Outback, this three-piece shovel features a muti-core, steel-reinforced fiberglass shaft. Unlike imitation models that aren’t reinforced, the Ultimate Shovel won’t snap while digging out vehicles buried in deep sand. When the job requires only a spade, the D-handle’s steel threads screw directly into the 7.5-inch-wide heat-treated blade assembly. The Ultimate Shovel is ideal for everything from overlanding to field service to “soft-roading.” All three pieces stow in an included bag. For more information, please contact Extreme Outback Products, 866-447-7711, info@extremeoutback.com,www.extremeoutback.com.